Picking up from last issue, Hugo Strange is suffering from a mental breakdown, and see’s his son David’s face in everyone he sees. Batman lies unconscious and without his memory in Selina Kyle’s apartment. He soon finds himself dressed as “Catman,” and Catwoman tells him they are partners in crime. She leads them to a museum, where “Catman” nimbly dodges laser defenses and steals a valuable ring. 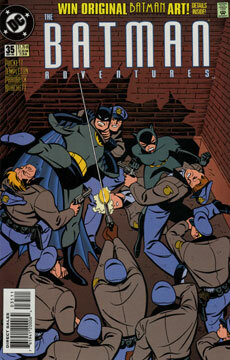 Meanwhile, Robin and Commissioner Gordon link Batman’s disappearance to Strange’s experiments. Robin theorizes that diamonds are involved, and knows Batman appears to be stealing diamonds. So Robin and the Commissioner set a trap. Catwoman and “Catman” see a newspaper story about some priceless jewels, which is of course the trap. “Catman” expresses doubts about their actions. Catwoman gets mad and leaves. Hugo Strange continues to freak people out with his crazy behavior. That night, Catwoman arrives to steal the jewels, but Robin is waiting for her. “Catman” arrives to defend her, but Robin reminds him of whom he really is. The two return to the Batcave, where Robin and Alfred realize Bruce has the mind of his sevr-year0old self, and does not know his parents are dead. Part two of an odd three-part story. Again, the pacing of this story is off. I can’t decide if it’s about Bruce, Selina, or Strange. Who is the protagonist? I suspect if this had been a two-parter instead, the script might have proven tighter. As it is, it is burdened under it’s own weight. And we only see Strange twice, running around like a crazed lunatic. Are we supposed to care about him? I can’t tell. It’s on par with last issue. Decent Parobeck, but not his best. Someday I’ll make a “Catman” custom. How come this has to have happened before “Bane”? What holds it to that? I’m afraid I’ll have to read it through again to answer that. There must be something in the story that gives it a time frame. I doubt I’d have been so specific mentioning “Bane” otherwise. If I can find the time, I’ll try to respond back.